This is one method that can be used to trap House Sparrows (HOSP) in a nestbox when other birds (Tree Swallows, Bluebirds) are also going in and out of the box. You have to be there to trip the trap. Also see other methods of active and passive control. Get a wooden paint stirrer or piece of thin metal about 1" wide x 4" long. Drill a small hole in one end, in the center near the edge. Round off the corners so when it will swing down, clearing the roof. Place the piece horizontally just above the nestbox entrance hole and center the small hole in the end of the rounded strip over the nestbox entrance hole. Mark the excess that sticks out past the box and trim. Drill another small hole in that end. Put a small wood screw in the rounded end hole on the strip, and center it above the entrance hole (on the outside of the box). Tighten the screw just enough that the strip swings free and falls down, covering all or most of the entrance hole. With the strip falling freely and hanging down in the "trapped" position, covering the hole, put another small screw just to the right bottom of the strip, "in the door", to serve as a stop, so the strip will not swing past the hole. Put a small round "eye screw" (like a screen door hook goes in) in the bottom center of the front door. Get a cheap spin cast fishing rod with about 6 lb. test line. Feed the line up through the baffle, then up through the eye screw, then over to the left side and tie it in the outer hole in the strip. Push the strip up until the hole is completely open and place a small stick or toothpick in the crack between the door and the side of the box - just tight enough to hold up the strip in the horizontal position. Move back far enough from the box and test it a few times by taking up the slack in the line and giving it a small jerk, pulling down the strip over the hole. If a HOSP/starling enters the box, give it a jerk to trap it. If a native bird claims the box, tighten up the screw so the strip will not accidentally fall down and leave it in place. 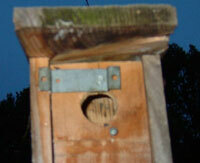 Put up a sparrow spooker as soon as the first egg is laid to protect contents from HOSP attack. The HOSP certainly wasn't introduced for its beauty. It is kinda cute when it "dusts" itself in the sand. However, Ted Bundy was not a bad looking guy either.